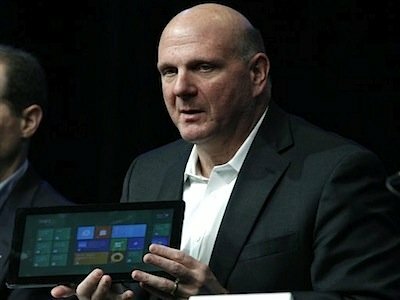 The year 2012 will go down in history as a major milestone for Microsoft. The once dominant company started the year under tremendous pressure after continuously losing users, market share, and hipness to a new breed of vendors driving the perfect storm of change. This change is based on the shift to mobility, social software and cloud computing and companies such as Apple, Google, LinkedIn, Dropbox, and Amazon are Microsoft's new arch-enemies. Microsoft wasn't sitting idly by watching the market forces unfold, though. In fact, it is hard to find any blemish on Microsoft's execution in 2012 and the company delivered on all key battlegrounds. With Office 365, Microsoft demonstrated that they are all-in at betting the farm on the cloud. With the purchase of Yammer (and Skype before), they are making great strides to become a force in social software. Microsoft Windows 8 operating system is attractive, innovative, and differentiated. With the help of Nokia, Microsoft delivered some impressive smartphones and the Microsoft Surface tablet is receiving good reviews (well, until they announced the pricing earlier this week). Measured by their product execution, Microsoft turned things around in 2012 and the company is cool again. The problem is, however, that Microsoft continues losing users and market share. According to comScore, Microsoft mobile OS market share has continued declining and remains in the irrelevant territory with 3.2% (IDC gives them 3.6% which is about the same - really bad). Gartner predicts, that 90% of enterprises will skip Windows 8 and consumers are wishing for Apple devices under the Christmas tree. Finally, early indicators suggest that the Surface is not selling well either. Why is that, you wonder? Microsoft designed a perfect combination of operating system, devices, social tools, cloud, and even enterprise applications. All of it is beautifully integrated and does (almost) everything you need. The problem is, that it only works with Microsoft. That's right. Just like in the old days when the Wintel architecture used to dominate the market with well over 90% market share, Microsoft continues building products that assume we live in a Microsoft-only world. Do you want to access any of the Microsoft consumer services? Well, you need a Microsoft email account like Hotmail. Do you want to work with a Microsoft application from an iPad or an Android device? Tough luck, you will always be a second class user at best. Wanna search? Get used to Bing! Microsoft's continued insistence on this puritanical approach to architecture is creating an interesting dilemma. A Microsoft-only environment may work great but you will only find such an environment on the Microsoft campus. If you use any non-Microsoft platforms, the appeal of Microsoft’s closely-integrated architecture diminishes fairly quickly. That includes pretty much everyone as over 96% of users today have a mobile device running something other than Windows. Microsoft is finding itself in completely unfamiliar territory. The world is not all about Microsoft anymore. Do you want to share documents with friends? Chances are much higher that they have a Dropbox account rather than a Microsoft SkyDrive account. Do you want to create a professional community of interest? Everybody has a LinkedIn account while Microsoft Live has...does it still exist? Do you want to use SharePoint from a Mac or an iPad? Tough luck! You may be better served by another ECM vendor. Microsoft’s finding itself on an inflection point. While they are delivering some very competitive products, those products have been built for a Microsoft-only world that no longer exists. To address this problem, Microsoft will have to open up and mandate all its groups to go multi-platform. That might be their only chance to start gaining market share again. That's a tough pill to swallow for a company that has single-vendor architecture in its DNA. It is a particularly difficult move, given that Microsoft's top competitor, Apple, has persevered through decades of single-digit market share to become the world’s largest company - based on a puritanical single-vendor architecture! Are We Teaching Obsolete Skills? Can We Solve the Security Dilemma?